As part of Lionel Racing's "Paint the Track Pink" program, some of NASCAR's biggest stars are getting a pink makeover in the month of October to support those diagnosed with breast cancer and to fund research and development. A portion of proceeds from each diecast car sold will benefit cancer research and prevention. 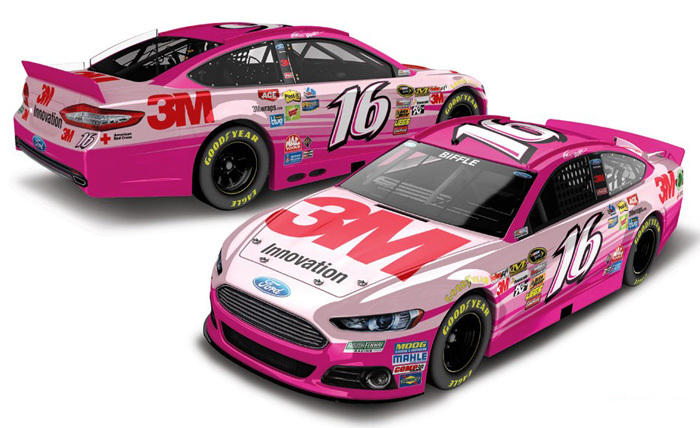 2015 Kyle Busch #18 M&M's Pink / Toyota Camry NASCAR diecast, by Action. 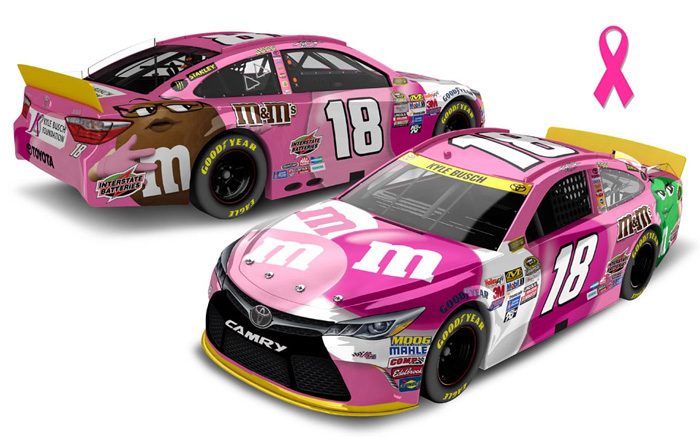 The Joe Gibbs Racing #18 M&M's Pink Toyota was raced by Kyle Busch in the NASCAR Sprint Cup, Bank of America 500 at Charlotte Motor Speedway on October 10, 2015. 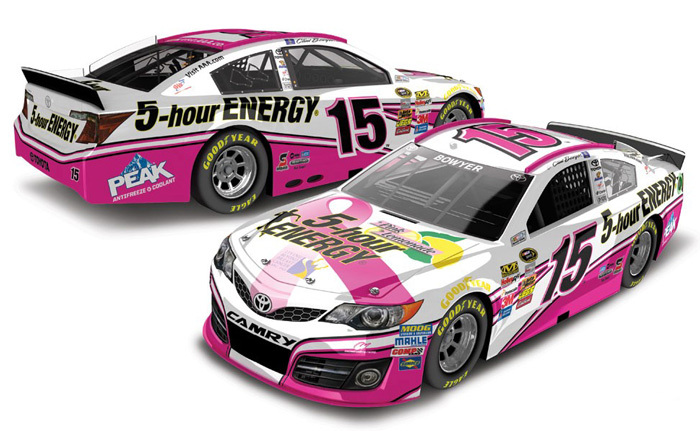 Kyle Busch is racing this Pink #18 M&M's Toyota In celebration of Breast Cancer Awareness month and all it's survivors. Autographed - This diecast car was autographed by Matt DiBenedetto, on the windshield in Silver. Includes an Action Racing Collectables certificate of authenticity. 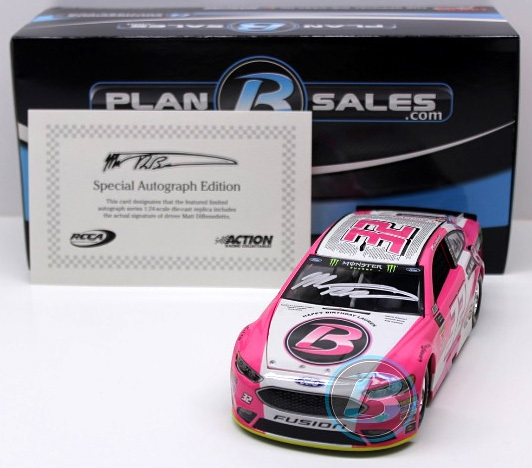 2018 Matt DiBenedetto #32 Plan B Sales Pink / Ford Fusion NASCAR diecast, by Action Lionel. 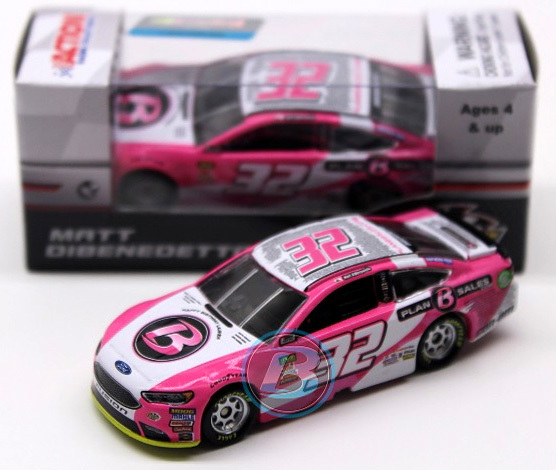 The Go FAS Racing #32 Pink Ford was raced by Matt DiBenedetto in the Monster Energy NASCAR Cup, Hollywood Casino 400 at Kansas Speedway on October 21, 2018. 2015 Courtney Force / Traxxas Pink / Chevrolet Camaro NHRA Mello Yello Funny Car diecast, by Action. The John Force Racing Traxxas Pink Chevrolet Camaro was raced by Courtney Force in select events during the 2015 NHRA Mello Yello Drag Racing Series season. 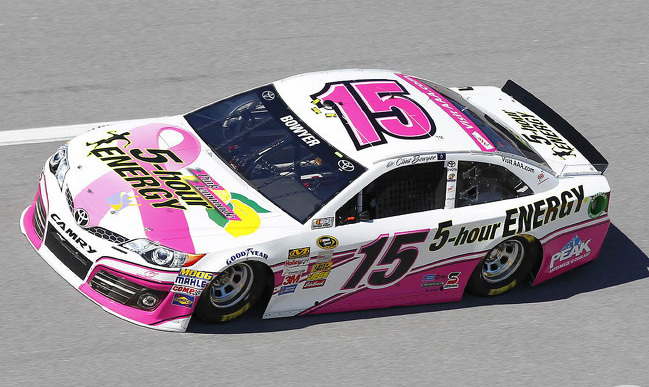 Courtney Force raced this "Pink" Chevrolet during the month of October, in honor of Breast Cancer Awareness Month. 2013 Courtney Force / Traxxas Pink / Ford Mustang NHRA Mello Yello Funny Car diecast, by Action. The John Force Racing Pink Breast Cancer Awareness Ford was raced by Courtney Force in the Auto Plus NHRA Nationals at Maple Grove Raceway on October 3-6, 2013. A portion of the proceeds from each Traxxas Pink diecast sold will benefit breast cancer awareness. 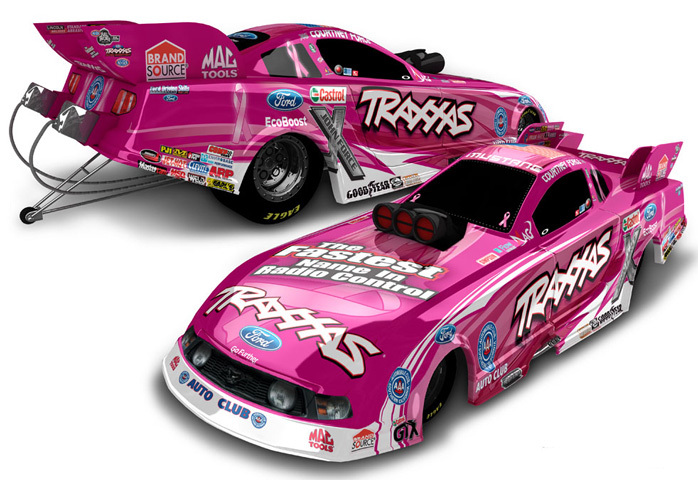 2012 Courtney Force / Traxxas Pink / Ford Mustang NHRA Full Throttle Funny Car diecast, by Action. The John Force Racing Pink Breast Cancer Awareness Ford was raced by Courtney Force in the Auto-Plus NHRA Nationals at Maple Grove Raceway on October 4-7, 2012. A portion of the proceeds from each Traxxas Pink diecast sold will benefit breast cancer awareness. 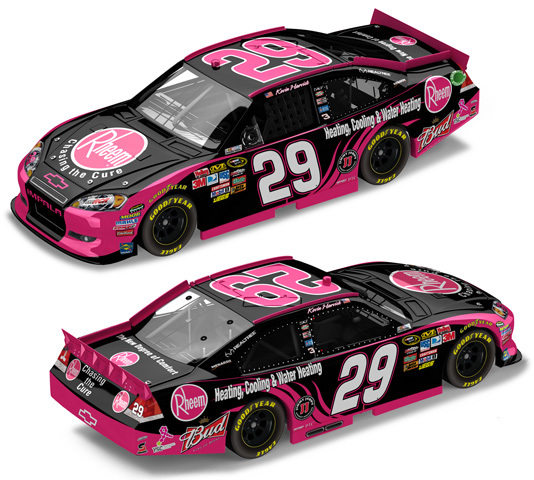 2011 Kevin Harvick #29 Rheem / Chasing the Cure Pink / Chevrolet Impala NASCAR diecast, by Action. The Richard Childress Racing #29 Rheem Chasing the Cure Pink Chevrolet was driven by Kevin Harvick in the NASCAR Sprint Cup, AAA 400 at Dover International Speedway on October 2, 2011. Harvick is driving this pink car in support of breast cancer prevention and awareness. This diecast car is displayed on a clear base. 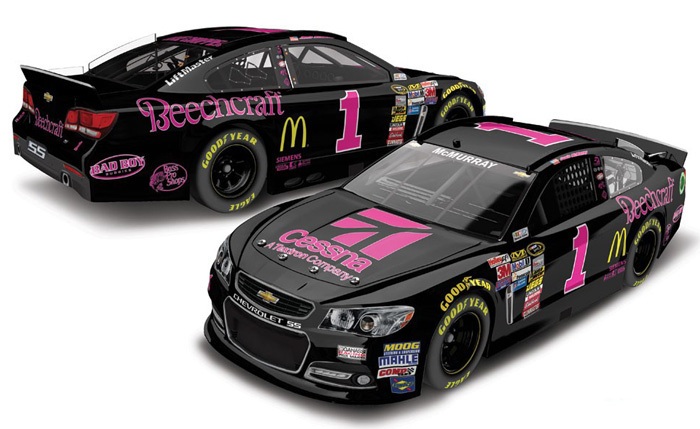 2014 Jamie McMurray #1 Cessna Pink / Chevrolet SS NASCAR diecast, by Action. 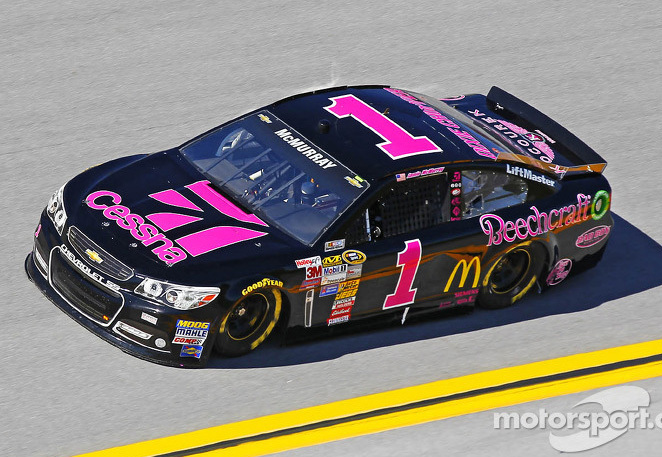 The Chip Ganassi Racing #1 Cessna Pink Chevrolet SS was raced by Jamie McMurray in the NASCAR Sprint Cup race at Kansas Speedway on 10/5 and Talladega Superspeedway on 10/19/14. 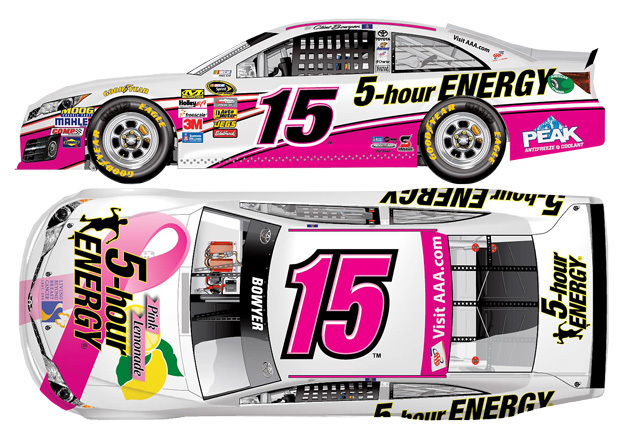 Proceeds from the sale of each diecast car will benefit breast cancer research and prevention. 2013 Regan Smith #7 Fire Alarm Pink / Chevrolet Camaro NASCAR diecast, by Action. 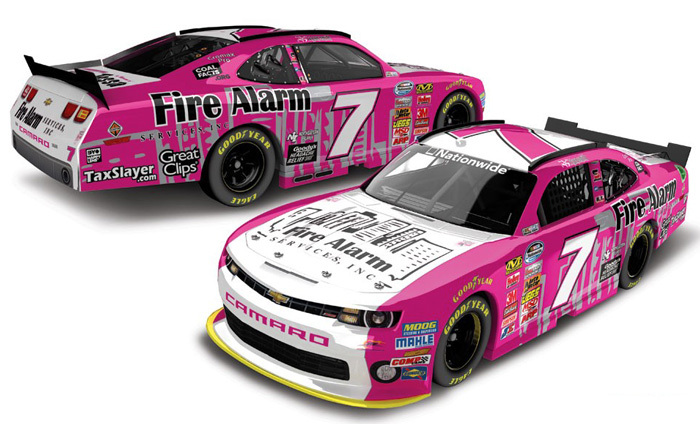 The JR Motorsports #7 Fire Alarm Pink Chevrolet Camaro was raced by Regan Smith in the NASCAR Nationwide Series, Kansas Lottery 300 at Kansas Speedway on October 5, 2013. 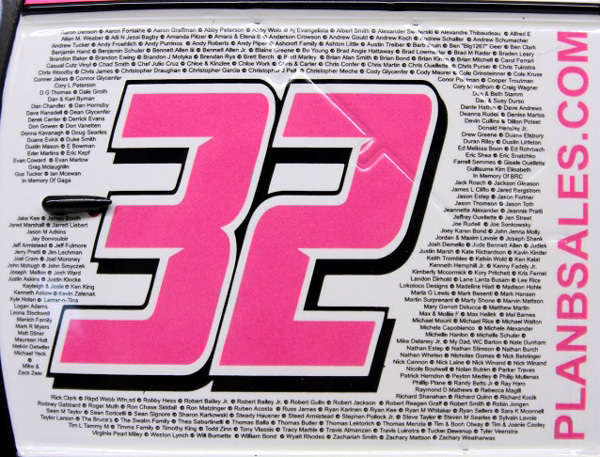 A portion of the proceeds from each diecast car sold will benefit breast cancer awareness, research and prevention.